He may not have gone anywhere in the hearts of classic gamers, but Frogger is apparently back again. 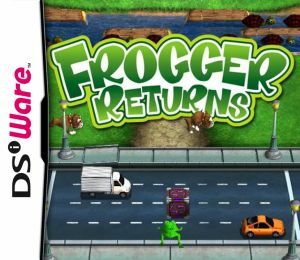 This DSiWare edition of Frogger Returns is essentially the same game as on WiiWare, albeit without the underwhelming multiplayer of that version. The stages, modes, power-ups and graphics are largely all the same (although lower resolution in the latter case), so if you've spent any time with that download then you'll know what to expect here, only now you can play it on the go. 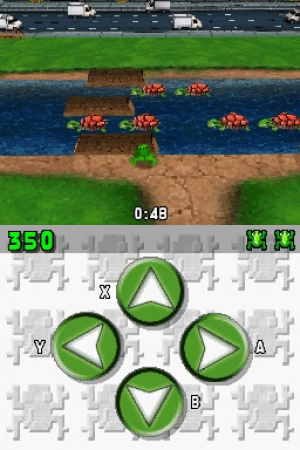 Frogger operates on a pretty simple premise: guide the little green guy across the stage while avoiding assorted hazards. Do this successfully five times and you move on to the next, more elaborate stage. The four stages are much more elongated than what you might be used to if you've only played the arcade version, and the mix of old and new environments and hazards is just enough to stay faithful to the classic while branching out. Arcade, Time Trial and Score Attack should satiate whatever desire you have for getting the little guy through hazards for score, and Casual eschews limits altogether and lets you play for as long as you'd like and die as often as you'd care to. 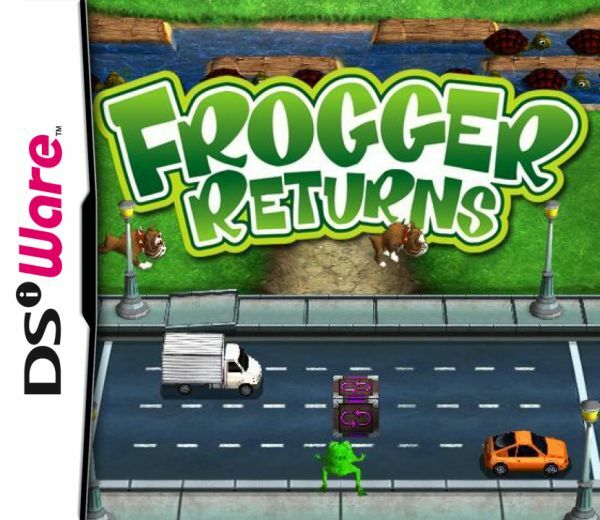 That isn't to say it brings nothing new to the table over the WiiWare edition: for an arcade game like Frogger, portability becomes a huge plus, which alone might make this DSiWare release the preferred version for series fans. There are a few missed opportunities and puzzling design choices here, though. For a game vertically oriented in its stage design, you'd expect the developers to make use of the stacked screens the DS offers to show more of the playing field. Instead, all of the action takes place on the top screen, with the bottom screen relegated to touch controls. It's a wholly unnecessary addition because both the D-Pad and face buttons control Frogger better, and it also occupies primo screen real estate that could've been put to better use. One of the issues we had with the WiiWare version was the viewpoint: it was a bit too angled to properly show what was ahead of you, which led to a lot of misjudged leaps and dead frogs. Having a smaller screen doesn't help these matters, although once you're used to its quirks then you should be able to get by with a minimum of pointless deaths. The camera issue could've been solved had it taken a more faithful top-down approach and used both screens for gameplay, but instead we have the same viewing problems (on a smaller screen, no less) and four useless extra buttons. Frogger Returns on DSiWare feels like something of a missed opportunity. 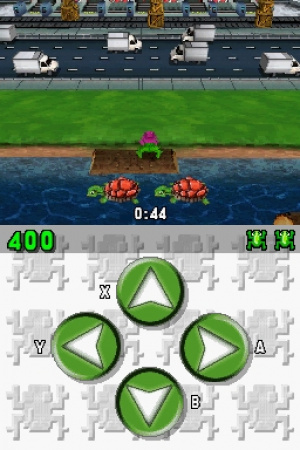 Had it embraced the strengths of the DS and as a result solved some of the issues of the console entries then it could have been the ultimate portable Frogger game, but it settles for as straight a port as it can be with little regard for its new platform. As it stands, it's merely a decent Frogger game. Is it the same as the PSN version? I have to say that I would definitely play this more on the DSi; not using the lower screen is a big waste I agree. Still it's a decent effort and better than some of the misguided "3D" attempts from the Sony Playstation days. @Gogata: I believe that's the case, but you can probably try comparing videos on YouTube to confirm. I like the WiiWare version, but I agree that the non-use of the lower screen is disappointing here. I don't think as many people cherish Frogger as we're led to believe. How many updates have there been now? and it's not like they ever change the gameplay. I still love it, but I think you might be right, JimLad. Having sold my North American Wii I cannot say I've been motivated to purchase it on my PAL or Japanese systems. Nevertheless it's a classic that I enjoy, so I may have to correct that oversight! If you think this is bad, you ought to see the iPhone version that they released a short while back, Frogger Inferno. It's exactly the same as the other version they have on the iPhone except for one big change. The big addition? You can't retrace your steps. Wow. Talk about an improvement! Lame and easy? It's a high score game. You play for bragging rights, not because "you're good" or "you can beat it". GLC forever, baby! I was planning on getting this but I'm not sure if I will now. Is this the same frogger game on PC like 10 years ago? Sure looks like it. Might be fun to have on your DSi for those moments when you want to play for 5-10 minutes. @DAaaMan64: It wasn't a PC Game (Although there was some ports and some sequel). It was an arcade game. If it looks like what you've played and shares the same name, then it probably is. Starpath made an awesome port for the Atari 2600, check it out. @ODOGG618 That's the problem though! Getting the highest score was just a case of who could be bothered to play the longest, because it was so easy to avoid traffic, and the difficulty barely changes. hasn't this frog been ran over enough?